Different configurations for Motorsports, Automotive, Commercial Trucking and Military allows for ease of mounting into scale models. Wind Tunnel Scale Model Contained Force Measurement with Automatic motion control in pitch, roll and yaw modes. Designed in house by ARC, the model motion system is a state of the art scale model force measurement system. Accurate and repeatable aerodynamic numbers are produced by mounting the system inside of the scale model and utilizing an Aerotech 6-axis force measurement balance. The system also features an all new internal gear system to minimize backlash and provides high level accuracy of model movement. By using an installation box the system can be mounted into a scale model spine with a minimum internal width of 240mm, length of 480mm and height of 240mm. An alternate installation box allows for use in a narrow scale model spine with a width of 190mm. The Model Motion system provides a range of yaw motion of +/- 14°, roll motion of +/- 5°, and pitch motion of +/- 4°. The use of stepper motors driving through a gear reduction system to multiply torque allows the range of motion to be repeated time after time. Built to reduce compliance and increase test repeatability to the highest levels possible, even when the scale model experiences restorative yaw force moments induced when commercial testing truck scale models and pitch moments induced when testing race car scale models. This is accomplished by means of an adjustable bearing shim preloads during assembly and the use of a worm-drive gearbox / ball screw to control pitch motion, with minimal gear backlash. 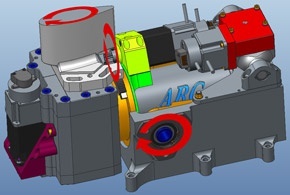 For increased aerodynamic simulation, the system also provides an air circuit to allow the use of a compressed air feed, routed down the sting, so as to allow the option of blown model exhausts etc. To use or purchase, contact ARC via e-mail or phone at 317-291-8600.